We only sell the highest quality feathers. You can be assured that all feathers are steamed and sanitized before leaving our warehouse and shipped to you. These are a very popular item for accents in floral centerpieces. Many of our customers also use these for costume and mask making. 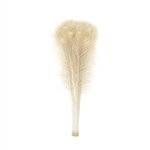 We offer natural feathers (as seen here with these peacock feathers), dyed peacock feathers, and dyed ostrich feathers. Animals are not hurt in the gathering of feathers. They shed naturally. Dyed Hot Pink Peacock Feathers 35"-40" (Pack of 100) - EXTRA DYE!! 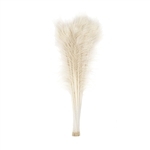 Hackle White Feather Wreath 19"
Hackle Wreath Brown Peacock Feathers - 15"